Approximately 70% of eye care-related problems, such as cataracts, are seen by an optometrist. 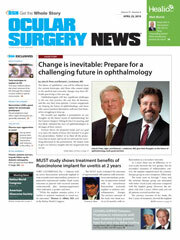 As we all know, optometrists work with ophthalmologists to refer surgical patients to or to co-manage with. One often overlooked business development area is optometric development or optometric co-management. My next few blogs will explore what our practices do to grow their optometric referrals. The first step in hosting a CE meeting is to get your course approval by your state optometric board or the Association of Regulatory Boards of Optometry (ARBO) for Council on Optometric Practitioner Education (COPE) certification. Most state optometric boards recognize ARBO/COPE for CE credits, but some states require that you submit your CE course for approval through them. To see your state CE requirements, visit this link. Before submitting anything to ARBO, you must become a COPE administrator. You can do this by visiting ARBO.org and following the instructions on the website. 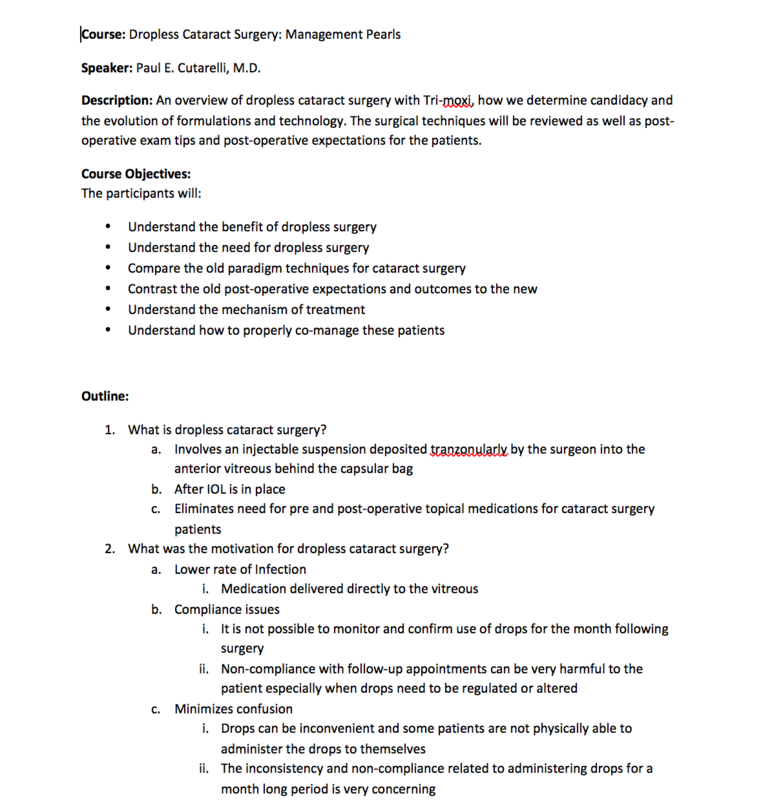 Once you’ve become a COPE administrator, you will need to create an outline of the topics you will be presenting. The outline will need to be about 1.5 to 2 pages long (Figure 1) per hour of presentation. Make sure the outline is in sufficient detail so optometrists can clearly follow along. Each bullet point should be a slide in your presentation. Once you’ve created your outline, you will need to submit the document for COPE approval to ARBO. The approval process generally takes about 2 to 3 weeks; however, you can pay a small fee and typically have it approved within 48 hours. Once you’ve received approval, you’ll need to create an invitation (Figure 2) for your event. The invitation should include course instructors (usually a 2-hour CE meeting will consist of yourself and another doctor), location (more to come on this later), the time, an overview of your talk and a statement conveying you’ll be serving dinner/cocktails, as well as who they can send their RSVP to. Typically we’ll create the invite as a 8.5” × 11” flyer so it can easily be faxed back. In addition to faxing back the form, also list a specific person in the office they can call/email their RSVP to. Once the invitation has been created, it too needs to go to ARBO for approval. Once approved, the invite may be sent out. When picking a venue to include on the invite, it is wise to get an estimate of how many people you think will be attending. I think for most midsize markets, it’s fairly easy to get 40 to 60 optometrists to attend your meeting. In larger markets, meetings can consist of 100 to 200 optometrists. I recommend you have classroom style seating at the venue; this is where everyone sits at long tables, facing forward, so they can easily watch the presentation. 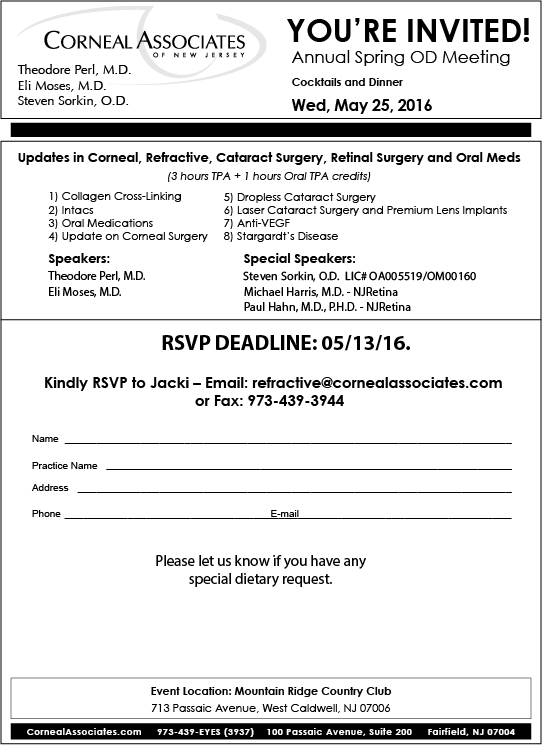 I also recommend you serve dinner and cocktails, as many optometrists look forward to this part of the meeting. Make sure your venue has full audio/visual capabilities. The last thing you want is a screen that’s too small to see or an audio system that is difficult to hear. In the past we have used country clubs, hotels and restaurants to hold CE events. My advice is to find a venue that will hold the number of people you expect to attend and get quotes from at least three venues. Costs typically range from about $50 to $80 a head but includes the room, audio/visual setup, and food; however, cocktails are usually a separate charge. On the day of the meeting, show up early; bring a sign-in sheet, a stack of name tags and a permanent marker. Have attendees write their name on the name tags so everyone can easily remember everyone’s names. Also, use the sign-in sheet to track the participant’s name, email address and license number because you will need this for CE credit submission, especially if CE approval came through the state vs. ARBO. As stated earlier, most states accept ARBO/COPE. ARBO has cleverly created the OE Tracker. This is an easy way ODs can claim their CE credits through COPE. During your presentation, you’ll usually speak for about 45 to 50 minutes, leaving about 10 minutes for Q&A, a quick bathroom break and onto the next speaker. In conclusion, CE meetings are about educating and building relationships with optometrists who are looking for a place they can trust to send their patients for various eye issues. Don’t miss out on this amazing method of growing your practice. It’s easier than you think!